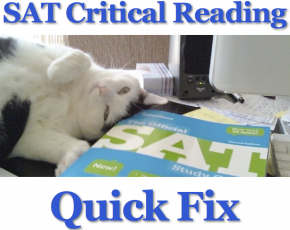 Here’s the secret to dramatic improvement in your SAT score. In my last two posts, I debunked two big myths of SAT preparation: the myth of content, and the myth of tricks and techniques. For those of you who haven’t read the posts, “The Myth of Content” describes how most students who take the SAT already know most of the content on the test. You may have to learn some, but any halfway competent tutor can explain it to you, and focusing only on the content isn’t getting you the most bang for your buck. In “The Myth of Test Taking Tricks and Techniques,” I point out that some of the tricks and techniques you’ll hear about from some of the test prep companies are just plain idiotic. What you want to learn instead are the proper thought processes that help you to maximize every last bit of knowledge you have. But even that is often not enough. So if content and techniques aren’t the key to dramatic improvement, then what is? The key to dramatic improvement in your SAT score is learning to manage your attention, your emotions, and your beliefs. I’m not saying it’s easy. But it’s not as hard as it sounds. The good news is that there is A LOT of leverage in this area, so even a little improvement here goes a long way. Think about it. We humans are great learners. We’re learning machines, actually. Babies and young children learn at an amazing rate. Then at a certain point, things start to get in the way. Not in the way of all learning, but in the way of learning certain things. Why can a teenager who can’t seem to learn algebra master a complex video game? Why can another teenager who has trouble writing an essay easily learn a task as complex as driving a car? Think about your own life. What have you had trouble learning? Did you have trouble sticking with it? Did you get frustrated when you didn’t do it well, and maybe even feel down on yourself? Did you come to believe that you just weren’t able to do that particular thing, that maybe it wasn’t for you and you should just give up and move on to something else? Well the thing is am from Ghana and as an international taking an exam that no university in your country require in their admission requirement, it can be really scary you know. My sole aim of taking the SAT is to probably get into a good college in the US and do my best to stay at the the top coz thats what I do. Now here is the problem, you saying we should learn how to manage our attention, emotion and beliefs. My emotion pretty screwed up with fear, my attention is even frustrated that I thought considering my target score and gaols and as for my beliefs, I’ve got that one under control coz with God everything is possible. I dont know whether you understood what I said buh I could really use some advice here. Please sir. Thanks for your note, Daniel. Your faith in God puts you ahead of the game. I’d talk to other people differently, but since you know that with God everything is possible, allow that to calm your fears also. Let that greater power take care of the outcome and place all of your attention only on your efforts. When we learn anything new, there are almost always challenges and setbacks along the way. Some people see them as indications that they won’t do well or that they’ll fail at their goal. However, if you believe that you’re going to do well, if you’re optimistic, and if you trust that if you do your best then something good will come of it, then the setbacks and challenges are just little bumps in the road. You may still feel frustrated, but it doesn’t matter because the feeling is momentary and it will pass. I hope that helps to point you in the right direction. Let me know.